It occurred to me today that running for me is “what I love to do” – and also “who I am” – a runner. The reason this is so is because I am very experienced and capable as a runner. I know how to plan, execute and measure my progress as a runner in such a way that I can forecast my probable results weeks – or even months – ahead of a particular goal. I am positive that ALL forms of running – whether they be indoors or outdoors – can and DO improve our ability to run faster and farther with greater ease. The miles we run add up to creating a body that is more fluid, capable, lean, and strong than the one we started with in the beginning. Today I ran on the treadmill – as I have for most of the past two years – and discovered some of the keys as to WHY I am successful as a runner. I will not discuss the various programs available on most treadmills today because that is way too general, but the run I had today CAN inform us on the “idea” of REAL “training” which is “working out with a purpose in mind”. 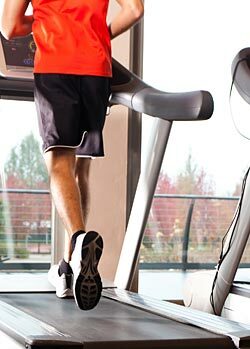 The various programs on a commercial treadmill are designed with variety in mind to keep the user from becoming bored or distracted; however they are also capable of becoming incredibly strong tools that we can use to improve not only our “psychology” as runners but our physical skills as well. I am now a proponent of using ALL the “tools at hand” to improve our physical skills and create a stronger, faster, AND more durable body that can take us into our future years with minimum stress. I chose the random profile today. I selected level 8 which is just below the midpoint for intensity (it ranges as high as 20 – a most challenging and advanced level). The incline used by the machine at this level ranges from 0-6.4 – moderate by the scale in the program. The speed I selected was 8.0 – 7:30/mile pace to as high as 9.0 – a 6:39/mile pace. My thought was to run 7 miles and increase the speed every time the treadmill declined to below 6.4 (highest angle) and increase the speed each time the treadmill lowered the angle of incline (down to 0 – level). The idea here is to train “over time” with varied speeds on a variety of inclines from easy to moderately challenging. The plan worked like a charm. My total time for the seven mile run was under 48:00 – meaning I ran under a 7 minute pace “on the hills”! To give you an idea of how I record my runs I will guide you through what is important to me for experience’s sake. I am interested in mile and half mile “splits”- meaning I want to know how I am progressing as the run unfolds. The treadmill allows for you to “pause” as you wish so that you can drink water or record “the numbers” as they unfold. I found my energy levels were as high –or higher – at the completion of the run meaning that my cardiovascular system and muscles are in tune with the “loads” I have placed upon them. The notion of progress comes in many forms but for me it is in my ability to hold certain speeds over time and distance that matter most to me. My goal of running 1 mile in under 6 minutes (which I CAN certainly do right now) can only happen if I can sustain such a pace over several miles – not just one. That is the purpose of training – to increase our body’s ability to handle various “loads” (like weight training does) over time and at a number of different speeds. The treadmill is an ideal partner for this process and I have now become a believer in the promise of “cross training” and using a variety of different tools. My splits (miles run) increased as my speed increased and this was because I kept the speed at higher levels every time the machine adjusted up or down every 30-60 seconds. This is a result of my confidence developing with this type of run. Now I know I can increase the level – and speeds – for subsequent runs because of how I felt today at the conclusion of the run. I tracked my splits – as for all my runs – by going from 1-7 miles – with half mile splits starting at 2 miles – and concluding with the 7th mile. I will add miles with this formula in the weeks ahead – meaning I will not only run farther – but faster as well. My splits today were 7:30, 14:26, 21:18 (3), 24:46 (3.5), 28:10 (4), 31:36 (4.5), 34:56 (5), 38:22 (5.5), 41:50 (6), and 45:10 (6.5). I will increase BOTH the level of intensity (to 10 and maybe up to 15) and eventually increase the speed as well to up to 10.0 (6 minute pace). These changes insure that I will experience continued growth both mentally and physically in the future. The timing of these changes depends on recovery periods and the time I choose to run future distances. The same rules apply to tracking results on outdoor runs, only the process contains a bit more guess work because measured distances tend to be less accurate and weather conditions and the like can add complexity to the results achieved. The idea of training with results in mind is very common for runners – we always want to know “how we are doing” and so today was a “measure of how I am doing” – and it felt great! Taking this example of a training run as a realistic one for all of us – and keeping in mind that I am a singular runner to myself because I am always only running against myself – we can decide to adjust our training to accommodate our body’s current ability and build upon it for future runs. Tomorrow I will do a “hill profile” but employ the same technique that I did today and since it is less challenging than the one I ran today on the random profile, I will either increase the speeds I run with or the distance and shoot for 8 miles instead. I will decide that tomorrow when I get to the gym. I will record my results and keep in mind my overall goal – run under a 6 minute mile on my 67th birthday. I am reinstating “the birthday mile” this year – it is time to “go for it”! Take this example and the thought processes that went into it and train for whatever your running goals might be – now and in the future. I will run outside again in a month or so and check my progress with the idea always in mind of having fun and being free to grow again mentally, emotionally, physically and yes, even spiritually, because running to me is a GIFT and I NEVER want to forget how truly lucky I have been – and continue to be – in the world as a runner!